Some memories are of photographs and not the incident itself, but some feel to the rememberer like they are of a photo, with the details so clear and so accessible. There is one memory … I could count the rocks in the creek bed if I would just take the time. I’m My Great-Great-Great-Great … Grand-Who? Almost every person with the last name Aldrich in the United States is descended from George Aldrich of Derbyshire, England, a tailor who was born in 1605 and emigrated to America in 1631, a decade after the Pilgrims. He is my great-great-great-great-great-great-great-great-great grandfather and probably the only one whose name I will know. George and his wife Katherine Seald Aldrich settled in Dorchester, Massachusetts, had 10 children (one, a daughter who died in infancy, bore a classic Puritan name, “Experience”) moved to Braintree, and then moved to Mendon, Massachusetts, where his name is inscribed on a monument naming the town’s first settlers. His second son, Joseph, is the great-great-great-great grandfather of Rhode Island Senator Nelson Aldrich, whose daughter Abby, married John D. Rockefeller II and was the mother of several prominent Rockefellers. One son, Nelson Rockefeller, carried “Aldrich” as his middle name. Another son, Jacob, had a dozen children, and those from his son, Joseph, were early settlers (in the 1740s) of Mattituck, on the east end of Long Island, and the Tafts, including President Taft. One of Jacob’s other sons was named Peter, born in 1686, and he is my direct ancestor. The sheer proliferation of Aldriches in America—when ten children have ten children, the family tree suddenly has a lot of branches on it—makes research a challenge. The genealogies have notes like, “Jacob 2 and Jacob 4 both had sons named Jacob who married wives named Sarah, or they are the same Jacob.” I exaggerated that a little. His death notice in the Arizona Citizen fills in some blanks: “Hon. Mark Aldrich died in Tucson, Sunday evening, of old age. … A very large number followed his remains to the grave. The Masonic Brotherhood took charge of his remains and buried him in accordance with the rights of the order. Mark Aldrich. Not the me Mark Aldrich. The other one. The deceased was seventy-one years of age. He was born in the state of New York, but subsequently settled at Warsaw, Hancock County, Illinois. We know but little of his early history, but are informed that he was three times a member of the Illinois Legislature, and served with Lincoln, Douglass, and other distinguished men who have since written their names high on the roll of fame.He came to California in 1849, and we believe engaged in mercantile pursuits. Of his history while there we are not informed. “Mercantile pursuits” in California in 1849? Whatever might those have been? That was the year the Gold Rush started. The first alcalde of Tucson? “Alcalde” is spanish for “Mayor,” so he was the first American mayor of Tuscon, Arizona. Hancock County, Illinois, in the 1830s was where Joseph Smith had led his followers in the Latter Day Saint Movement. Aldrich tried to sell Smith and his followers some land that he owned but Smith did not purchase. After renting the land, however, Aldrich turned into one of the worst landlords (or best, for Mormon history) and started changing the terms of the lease at whim. 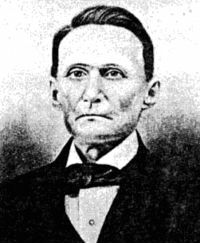 Smith and the early Mormons left and settled what became Nauvoo, Illinois; Smith named himself mayor and announced a run for President of the United States. Aldrich went bankrupt. Nauvoo is in Hancock County, the same county that Aldrich’s land had been on. Now a vocal opponent of the incipient LDS movement, Aldrich was also one of those figures one still sees a lot of in small-town America: he seems to have always been in at least one elected or appointed position wherever he resided. He was a major in the Illinois State Militia, and in June of 1844, Joseph Smith had been arrested and was being held in the Carthage City Jail. Smith was charged with ordering the destruction of the Nauvoo newspaper facilities because the paper, founded by former associates who turned against him, had printed stories accusing Smith of polygamy. The newspaper was declared a public nuisance and its press was destroyed, but so was its building. When a neighboring town issued a warrant for Smith’s arrest, he declared martial law in Nauvoo, which turned the issue into an Illinois issue and the governor ordered Smith put on trial. Smith was held with his brother in the Carthage City Jail and on June 27, 1844, a mob of hundreds stormed the jail. The two prisoners were killed. Someone had to have let the mob in. Someone had to have directed the mob. Aldrich, a militia major with men under his command who took part in the mob, was charged with four other men. A trial was conducted and an all-non-Mormon jury acquitted the five. Aldrich ran for sheriff of Hancock County the very next year. When I lived in Iowa, near Nauvoo, a friend invited me to visit Nauvoo. She did not know this history and I decided against risking matters. Within a decade, Aldrich was an early settler of Tuscon and its first American mayor. And his body is, to this day, buried under the streets of Tuscon. The cemetery in which he was interred was closed by 1890 as the city grew into city-hood and paved things. Most remains were moved to other locations in subsequent decades but no record exists that states that any Aldrich relative claimed the body of the former mayor and accused-but-acquitted murderer of the founder of the Mormon Church. When I was 18 and struggling with the identity issues that 18-year-old boys are supposed to struggle with, but a bit more loudly than the New England side of my family was accustomed to witnessing, my Uncle Richard had some advice: “Take one step forward and raise your right hand.” Military service was what I needed, he made clear in his loving but curt way, and he was the only family member, friend, or guidance counselor in my life to offer this advice. A couple decades later and a few mistakes along the way, I wonder if he might not have been correct, but only because I remember that at the time, we were not at war. Each new generation at war masters new technologies for waging war and new ways to describe it. The Civil War brought new fighting machines and battlefield photography; the Second World War debuted mass anonymous bombing runs and heroic, large-scale battles—it was the war for novelists and filmmakers; the First World War was the war of chemical attacks, soul-crushingly slow trench warfare, and new mechanical technologies of death-creation sadly under-anticipated by those who were planning for yet another war fought in straight lines. World War I was the absurd war, fought for reasons so complicated and obscure to the common fighting man that for Christmas Day 1914, an unofficial truce was declared by the soldiers on the battlefields of the Western Front and there, on the fields, carols were sung, holiday cards were exchanged between enemies, and joint burials of the battlefield dead were conducted by the opposing sides. It was the war for poets. Wilfred Owen’s “Dulce et Decorum Est” (Latin for “it is sweet and right”) is a poem that attempts to capture a small moment of death in the large landscape of a battlefield shrouded in mustard gas. It calls the Horatian declaration that closes the poem, “Dulce et decorum est/Pro patria mori” (“Sweet and right it is to die/for one’s country”), “the old Lie,” and there the reason for the poet’s close study of a fellow soldier’s violent death is delivered. For Owen, there is no great message to be gleaned from recounting his comrade’s gurgling death other than the sad, empty absence of any message. You would not tell children eager for heroic tales, he concludes, you would not tell them of great glory, if you were to see and hear the “smothering dreams” of death that he has seen. Owen himself died on November 4, 1918, one week before peace was declared, on November 11. So I honor our patriots this Veterans Day by reading a poem that reminds us of the absence in the grit of war of any heroic message, a poem that some 96 years after it was composed probably better describes the unconventional battlefields seen in our current conflicts than many attempts today. This is the story that moved me the most today. Clara Gantt of Los Angeles, 94 years old, accepted the remains of her husband on Friday at Los Angeles International Airport, a short time after learning that he had in fact died in 1951 as a prisoner of war in North Korea. That country has slowly, so slowly, begun to release information about and even the mortal remains of battlefield dead and dead POWs to its sworn enemy, the United States. Mrs. Gantt’s final contact from her husband was a Christmastime letter sent from the front at the end of 1950. Shortly after, historians now know, he was taken prisoner on the battlefield and died in Korean custody. They had only been married for two years, or 65, depending on whether one asks Mrs. Gantt. Her dedication to the memory of her late husband was such that she refused to consider him her late husband until this year, when she learned that the government had received remains from North Korea and positively identified them as Sgt. Joseph Gantt. She told reporters that even when she was able to purchase a house for herself in the 1960s, she also hired a gardener to tend it, since she knew he did not like yard work and she wanted him feel free to do whatever he liked when he returned home from the war. From the Los Angeles Times story: “During the last 63 years, no one else caught Clara Gantt’s fancy as she waited for news of her husband. She told the base officials assigned to check wives’ homes for other men to come by anytime, (as) they’d never catch her with anyone. Edith Aldrich had a gift that the widow in Los Angeles did not receive: She saw her husband every day for 64 years. But both love stories are priceless. As they grew old and then older, my grandparent’s life became that “complete” marriage. In their small Vermont hill town, the mail was delivered twice a day to the country store. My grandfather would march down the hill, cross highway 100 and the bridge over the West River, collect the mail and return. Her eyes would follow him every step. My grandmother outlived her beloved Bill by almost 14 years, dying in June 2009 at age 98. One day, years into her widowhood, she and I went for a walk on her road, the same road as the family cemetery, and she mentioned him.